The Church has not forgotten nor rejected those who are divorced and have entered into another union, affirmed Milan's archbishop. 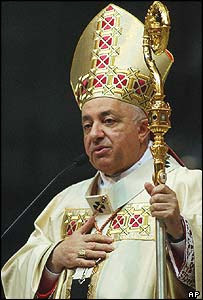 Cardinal Dionigi Tettamanzi affirmed this in a pastoral letter directed to the divorced and remarried titled "The Lord Is Close to the Brokenhearted." "The fact that these relationships are frequently lived with a sense of responsibility and with love among the couple and for the children is a reality that the Church and its pastors take into account," the cardinal wrote. "It is an error to think that the norm regulating access to Eucharistic Communion means that divorced and remarried couples are excluded from a life of faith and charity, lived within the ecclesial community." Certainly, "the Christian life has its summit in full participation in the Eucharist, but it is not reduced only to the summit," he said. The cardinal asked divorced and remarried to "participate with faith in Mass," even though they cannot receive Communion. "The richness of ecclesial community life continues to be available to those who cannot receive Holy Communion," he affirmed. The 73-year-old cardinal said that the Church hopes from these couples "an active presence and a willingness to serve those who need their help," beginning with the educational task they have as parents. Cardinal Tettamanzi said he wrote the letter to "establish dialogue […] to try to hear about your daily life, to allow myself to be questioned by some of your questions." "The Church has not forgotten nor rejected you, nor does it consider you unworthy," he wrote. "For the Church, and for me, as a bishop, you are my beloved brothers and sisters." The cardinal added that when a marriage breaks apart, the Church suffers too: "Why does the Lord allow the shattering of a link that signifies his total, faithful and unbreakable love?" "When this link breaks, the Church, in a certain sense, is made poorer, and a luminous sign that should be a motive of joy and consolation is taken away from it."